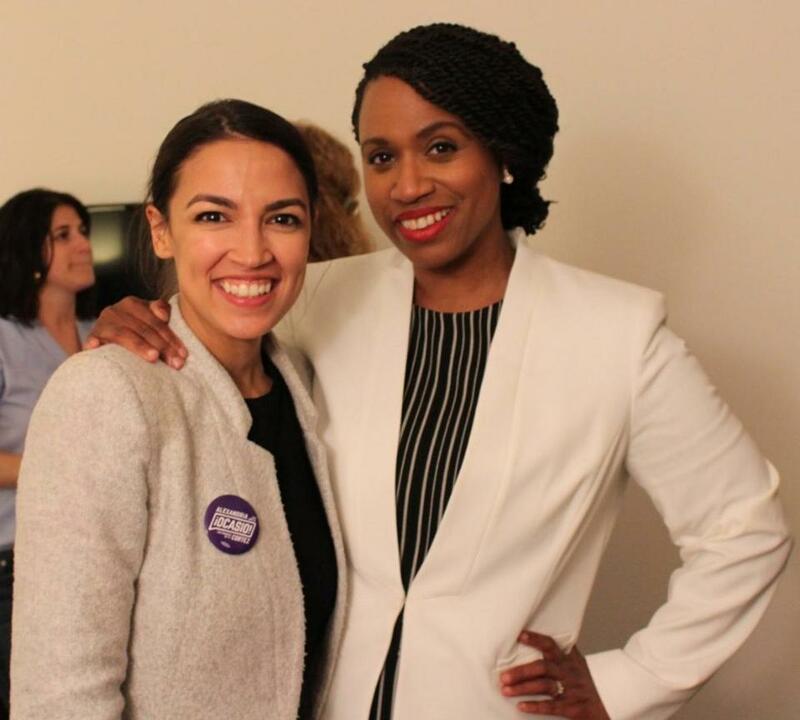 Alexandria Ocasio-Cortez and Ayanna Pressley in a Twitter photo from September 2018. A quartet of progressive women recently elected to Congress has arrived in Washington, D.C., this week — and based on their social media feeds, they’ve become fast friends. Ayanna Pressley of Boston, Ilhan Omar of Minnesota, Alexandria Ocasio-Cortez of New York, and Rashida Tlaib of Michigan have been taking people behind the scenes as they get ready for the start of the next congressional session together, giving supporters a snapshot of what so-called “freshman orientation” is like for incoming members of Congress. On Monday, Pressley, who became the first woman of color to represent Massachusetts on Capitol Hill, posted a picture of herself with Ocasio-Cortez, Tlaib, and Omar — all of whom were attending an orientation hosted by the Congressional Progressive Caucus — as they posed for a selfie. The image, which was shared on Pressley’s Instagram story, was stamped with the hashtag #Squad. Later in the day, Pressley, who won Massachusetts’ Seventh Congressional District, posted a picture of a notebook, pen, coffee, and a pin emblazoned with the letters BYOC — or “bring your own chair” — that she wore while campaigning. The freshmen who vowed to change Washington were getting an old-school education on political pressure from the veteran lawmakers who want to lead them. “Just a few freshmen orientation essentials,” Pressley wrote. “Elizabeth,” Omar wrote, adding a smiley-face emoji with jazz hands. “Going to hit the ground running fighting for #JusticeforAll,” Tlaib wrote. Last week, Tlaib and Omar became the first Muslim women elected to Congress. As for Ocasio-Cortez, who upset her primary opponent in New York’s 14th Congressional District, earning her the title of the youngest woman ever elected to Congress, there was no shortage of the documentation of the arrival of the four women to Washington. Her Instagram feed was peppered with videos and pictures of the group as they went about their day, attending meetings and getting up to speed on what’s to come. In one video, Ocasio-Cortez is holding her smartphone above her head, recording as they walk through a building while flashing peace signs and waving to the camera. Her video was later circulated by Pressley and the others on their Instagram accounts, with some using the hashtag #SquadGoals. One picture in particular that Ocasio-Cortez, a Boston University graduate, posted Monday seemed to strike a chord for many as an image of hope and was shared widely online. “This is a superhero squad origin story right here,” one person wrote in response to the photo.